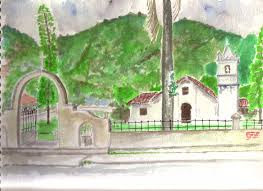 Costa Rica located in Central America has many rich traditional ghost stories. These ghost tales normally impart some kind of morale lesson and they often reflect religious beliefs. Three of these stories are entitled, Ox-less Cart, Cadejos and Headless Priest. A nice animated video at the end of this post shows parts of each of these stories--plus a scene from one other classic Costa Rican ghost story. This video is in Spanish but since the main character is running from one fright to the next without words, no translation is necessary to understand the action. 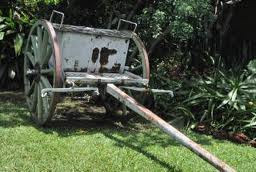 When Costa Rica’s capital city, San Jose was still a small village a thief incurred the wrath of the church, which condemned him to ride an ox-less cart for eternity. The villagers were busy repairing their church-- it needed new columns, altars and saints. The men went out one night under a waning moon when the sap on the trees is at the lowest point in order to cut down several Sour Cedar Trees. They brought the wood back to the village and had it blessed and then laid it out to dry. Shortly after this a man who was a loner from the mountains came into town and stole the wood. He needed it to build a house for himself. But a strange thing occurred when he finished loading the wood on his cart, his oxen refused move. The man whipped them until they bled and could take no more. Slowly the oxen pulled the stolen wood up the mountain. The man then built himself a house and used the extra wood to build a new cart. But the blessed wood only brought him bad luck and his oxen would not pull the new cart. The man became ill and died. Ever since, people say Saint Jose cursed him. His lifeless corpse is often seen in a cart as it careens down the road. No oxen pull it--for they were blameless. Cadejos is the name of a demon dog that appears at night. The sound of chains is heard being dragged behind it but they are never seen. This dog is the size of a small calf with matted hair, giant fangs and sizzling red eyes. This apparition when seen scares people but it is actually benevolent, for it is said it helps drunken men at night arrive home safely. 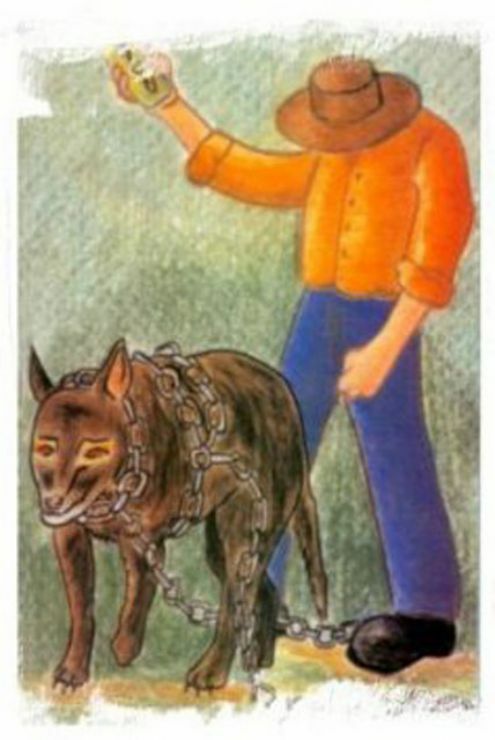 This dog protects these men from other night threats, such as, La Llorona or common thieves. In other Latin American countries this demon dog is good if it is white in color, bad if it is black in color. Once again this tale is about drunken men. This headless priest is know as, “ El padre sin cabeza”. One late stormy night during colonial times a peasant wandered the deserted village square. Too drunk to continue walking he sat down upon a bench. The wind picked up dead leaves landing them on his feet. As he bent down to brush them off he noticed there were lights still on in the church. He was startled to hear music coming from its open doors. He slowly entered the church and quietly passed by the rows of benches. Near the front of the church he spotted a figure of a priest giving a mass in Latin. Finding himself in a trance he approached with an urgent need to relieve himself of the burden of his sins. As the priest turned he was horrified to see where his head should be was a stump. The peasant cringed as the priest held out its bloody head in his direction. Struck dumb, the man fled the church overwhelmed by what he had seen. With time he regained his voice and changed his sinful ways. Here is the short animated video film entitled, “Asusto” meaning fright or scare. Pablo and Francisco Cespedes created this film. 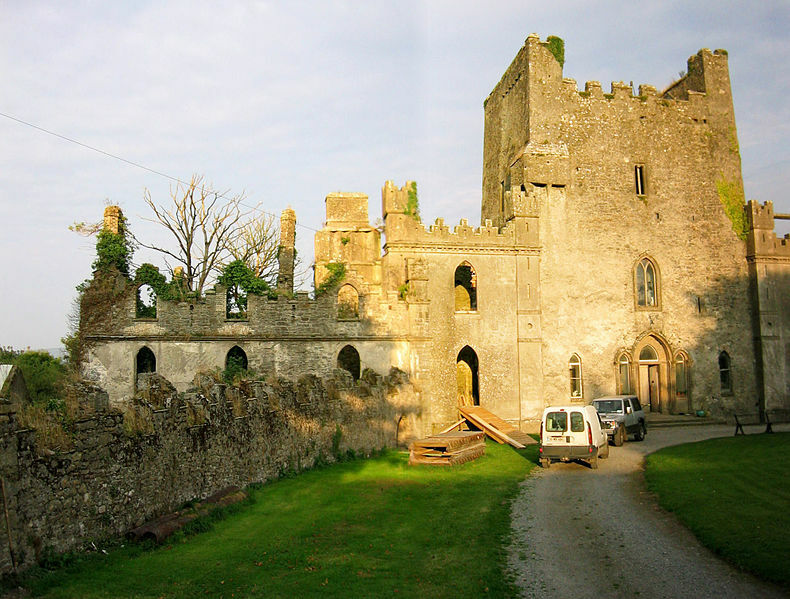 Leap castle with its “Bloody Chapel” located in County Offaly in Ireland is considered extremely haunted. Its troubles started over 400 years ago when a fierce battle broke out in the O’Carroll family over who was to be the next clan leader. This bitter fight turned brother against brother. One brother, a priest, was holding a family mass in 1532 when his rival brother entered what is now called the Bloody Chapel and plunged his sword into his sibling, killing him. This first evil event is said to have put a curse on the castle. The ghost of this priest is still seen at Leap. Over the years Leap Castle’s dungeon or oubliette off the Bloody Chapel was used to torture and kill prisoners. These prisoners were pushed down an opening in the floor where a spike impaled many eight feet below. The ones that didn’t die instantly found themselves left to smell the food aromas that arose from the rooms below as they starved to death. 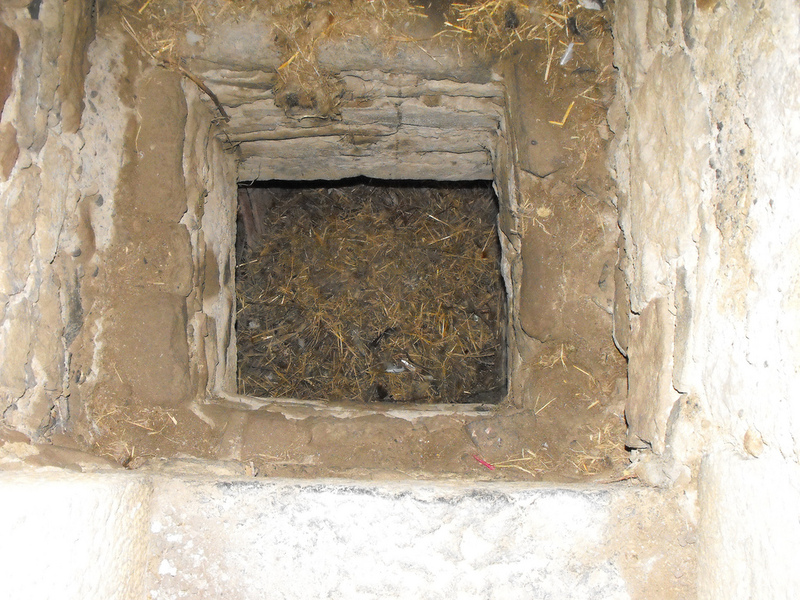 Workmen in the early 1900’s found evidence of this cruelty when they were cleaning out the oubliette-- they found human skeletons stacked on top of each other--it took several loads to remove all the bones. 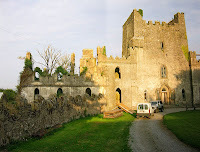 In the late 1500s a fire gutted Leap Castle. Its gate remained pad-locked for 70 years. During this time witnesses often reported seeing lights from the upper windows late at night. 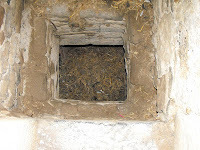 One report states, “it was as if many candles were brought into these rooms”. Even today the opening above the oubliette and the dungeon itself is very active. 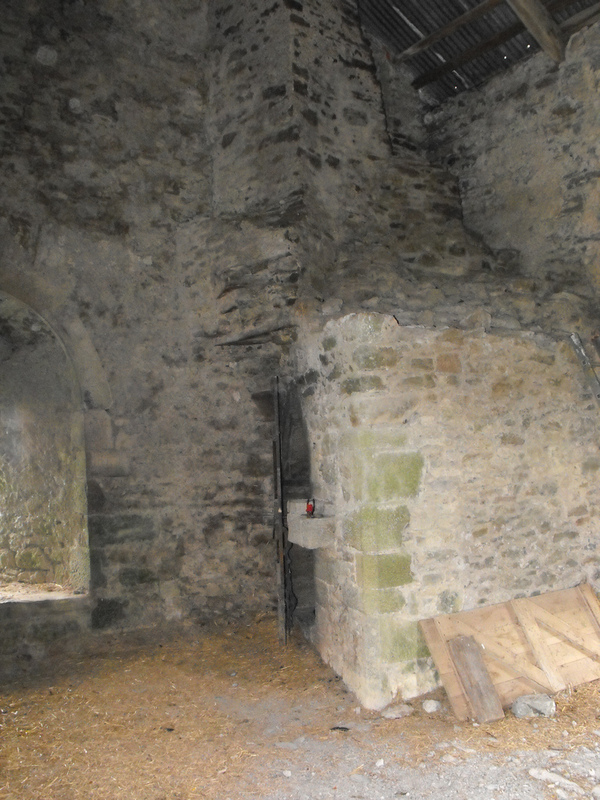 Many witnesses have seen shadow figures and ghosts in the Bloody Chapel. “The thing was about the size of a sheep, thin gaunt and shadow in parts. Its face was human, or to be more accurate, inhuman, in its vileness, with large holes of blackness for eyes, loose slobbery lips, and thick salvia dripping jaw, sloping back suddenly into its neck. Nose it had none, only spreading cancerous cavities, the whole face being a uniform tint of grey. This too was the colour of the dark coarse hair covering it head, neck and body. Its fore arms were thickly coated in the same hair, so were its paws large loose and hand-shaped and as it sat on its hind legs, on hand or paw was raised, and a claw like finger was extended ready to scratch the paint. It lusterless eyes, which seemed half decomposed in black activities, and looked incredibly foul, stared into mine, and the horrible smell which had before offended my nostrils, only a hundred times intensified, came up into my face, filling me with deadly nausea. After this account was published the castle gained the reputation for being even more haunted. It was stated that after Mildred’s innocent fun the castle became plagued with bad luck as well. The Darby family owned Leap for the next 113 years, until 1922. The Darby’s being English were literally driven out during the Irish struggle for independence. In the 1970’s an Australian purchased Leap. He knowing it was haunted brought in a white witch from Mexico to cleanse the castle. After this it was stated that the spirits remained but they were no longer malevolent in nature. The current owners of the castle bought it in the 1990s. During renovations two freak accidents left the owner injured. In the first he suffered a broken kneecap and in the second a ladder he was standing on tilted backwards suddenly from the wall it leaned against, the owner then jumped several stories to the ground--he broke his ankle. Despite these accidents the owners feel the spirits seem to be more at peace these days. But ghosts are still seen and felt. In 2002 the owner, his wife and a musician that was visiting stumbled across a ghostly old man sitting in a chair by the downstairs fireplace. * Elementals are considered primitive ghosts. They become attached to specific places. These scary ghosts are malevolent in nature and are very unpredictable. This story of El Muerto meaning “headless horseman” is a ghost legend from South Texas. A Mexican bandit by the name of Vidal plied his trade in a part of South Texas known as “No Man’s Land” in the mid 1800s. He like many Mexican outlaws spent his days on a strip of land between the Nueces and Rio Grande Rivers rustling cattle and stealing horses. 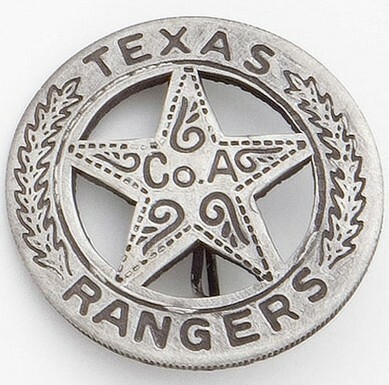 The Texas Rangers--basically wondering posses--were formed to drive out all the thieves and murderers that plagued frontier Texas. A dispute between Mexico and the U.S. over the land between the Nueces and Rio Grande Rivers had been resolved in 1848 when the U.S. had won the Mexican War. But the strip of land between these two rivers known as “No Man’s Land” was still overrun with Mexican bandits. By 1850 Vidal had a high price on his head and was wanted “Dead or Alive”. In those days stealing cattle and horses was considered a worse crime than murder. 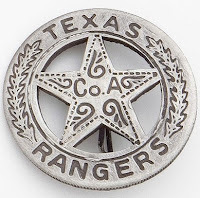 Two Texas Rangers, Taylor Creed and William “Big Foot” Wallace had spent a great deal of time in No Man’s Land trying to rid the area of Mexican bandits. They and their peers had resorted to some brutal means to try to dissuade the bandits from coming back. Finding that shooting them and hanging them from trees had no impact they had even chopped up the bodies and left them for animals. But the cattle rustling continued. Vidal and several of his companions became Creed’s and Big Foot Wallace’s target when they stole a heard of cattle and horses that unbeknownst to them belonged to Creed. The two Rangers had been away defending a white settlement from a Comanche raid when Vidal’s group stole the livestock. When Creed returned he found several of his prized mustangs gone. 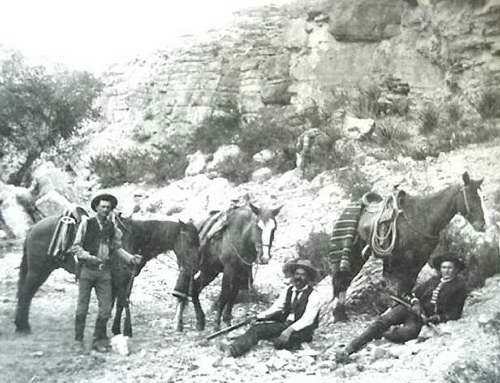 He and Wallace joined with a neighboring rancher by the name of Flores and proceeded to track Vidal and his fellow bandits. When these three men caught up to the outlaws they waited until they were asleep to attack. They then killed Vidal and his men. But this was not enough. Taylor and Wallace wanted to set an example to deter future bandits. Big Foot beheaded Vital and lashed his body to a saddle on the back of a horse. He attached Vidal’s severed head with its sombrero to the saddle with a strip of rawhide. He then turned the wild mustang loose to wonder the hill country. Soon stories started to circulate about a headless rider that was seen with his head swinging back and forth as a wild horse galloped by. This apparition so scared cowboys and Indians that soon Vidal’s mutilated body was riddled with both bullets and arrows. People stated calling this headless horseman El Muerto. As time went by a legend grew that people must avoid this strange apparition for if seen some evil misfortune would befall them. In the end a group of ranchers caught up with this poor burdened horse near Alice, Texas. They buried Vidal’s body in an unmarked grave near the tiny community of Ben Bolt. As soon as his body was laid to rest soldiers at Fort Inge began to see an apparition of a headless rider. Travelers and ranchers in No Man’s Land also reported seeing this strange sight. One written account that was recorded in 1917 mentions that a couple traveling to San Diego, Texas made camp for the night near a stream. As they sat at their fire that night they saw a large grey stallion speed by with a headless man atop it. They stated they heard him shouting, “It is mine. It is mine.” Yet other witnesses saw a similar sight in 1969 outside the town of Freer, Texas. Even today, people still claim to see El Muerto galloping through the mesquite in the bush country on moonlit nights. The Brown Mountains are located in Burke County in North Carolina. For centuries an unexplained light phenomenon has been seen along this Blue Ridge. These lights have been written about in numerous newspaper articles, several television documentaries have focused attention on them and even the Kingston Trio wrote a folk song about them. “The lights seem to resemble balls of fire from Roman candles. Sometimes they rise to various heights and fade slowly. Others appear to expand as they rise, then burst high in the air like an explosion without sound. On dark nights they pop up so fast and so thick that it is impossible to count them. They are visible from a distance but as one climbs the mountain they vanish". The first known sighting was in 1200 when Cherokee Indians stated they were the result of a great battle between their people and the Catawba Indians near Brown Mountain. A Cherokee legend describes the lights as the spirits of Indian maidens who have been searching through the centuries for their husbands and sweethearts who died in this battle. Another prevalent legend is that the lights are “a troop of candle bearing ghosts who are destined to march forever back and forth across the mountain”. Twice the U.S. Geological Survey has investigated the lights. The first time in 1913 they concluded the lights were the result of “locomotive headlights” from the Catawba Valley south of Brown Mountain. However, just three years after this in 1916 a great flood swept through the Catawba Valley. This flood knocked out the railroad bridges. It took weeks before repairs where done and the locomotives could run through the valley once more. This same flood also washed out the roads and the power lines. But the Brown Mountain Lights appeared as usual. It became apparent that railroad or automobile lights were not the cause--but most knew this for the lights were seen before these two forms of transportation even existed. 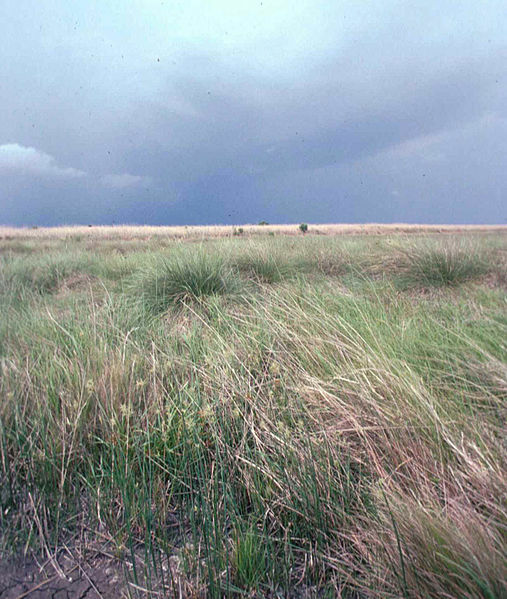 The second U.S. Geological survey reported the cause for the lights were “due to the spontaneous combustion of Marsh Gases.” But there are no marshy places in or around the Brown Mountains. In 1919 the Weather Bureau investigated and announced the cause for the lights was similar to the Andes Light in South America. In 1941 a paper written by Dr. Herbert Lyman agreed. The problem with this theory is the Andes Light which is a light seen around the Andes peaks when clouds rush around building up powerful charges does not occur below 15,000 feet. The highest point at Brown Mountain is 2,750 feet. Also in 1919, the Smithsonian ruled out St. Elmo’s fire being the cause for the lights. They basically stated that St. Elmo’s fire never occurs in midair like the Brown Mountain Lights. Recently, scientists have put forth the possibility the lights might be a mirage. * They state atmospheric conditions might cause reflections from Hickory, Lenoir and other towns in the area. The drawback to this theory is the fact the lights were clearly seen before the Civil War long before electricity was used to produce light. Today the cause for the Brown Mountain Lights is still a mystery. The only thing known for sure is they do actually exist and are seen on a regular basis. * The latest theory put forth by a Physics professor is the lights are caused by ball lightning--but I have not seen any evidence yet to back this up. The following is a local North Carolina news report that has nice photographs and video footage of the lights.